This stunning Crystal encrusted rose gold plated bangle is perfect to accompany any outfit d.. This elegant slim lined staggered 3 row yellow gold plated bangle is perfect to accompany any out.. This stunning 2 Carat Brilliant Cut Blue Lab-Created Sapphire Rhodium Plated bracelet is perfect .. This stunning 2 Carat Brilliant Cut Pink Lab-Created Sapphire Rhodium Plated bracelet is per.. This bracelet is made up of four rose gold plated hoops and three slightly larger hoops which eac.. 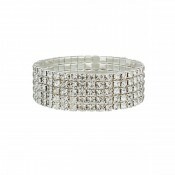 This stunning rhinestone encrusted white gold plated bangle is perfect to accompany any outfit da.. This elegant slim lined staggered white gold plated bangle is perfect to accompany any outfit. Th.. This bracelet is made up of five rose gold plated hoops and four slightly larger hoops which each.. This bracelet is made up of five yellow gold plated hoops and four slightly larger hoops which ea.. 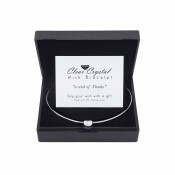 This elegant slim lined white gold plated bangle is perfect to accompany any outfit. The bangle c.. This elegant slim lined rose gold plated bangle is perfect to accompany any outfit. The bangle co.. This exquisite bracelet consists of 10mm royal blue and graphite Czech crystal beads and six haemati..